And so it came my turn to organise the MMC annual dinner meet. The Peak district town of Castleton chosen for its delightful caves, wonderful YHA accommodation and pub offering food at very reasonable rates. 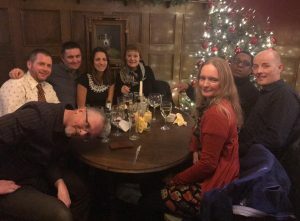 The 21 keen folks pitched into their (or someone else’s) cars and headed to the Losehill Hall (East wing of the Mews) the WhatsApp group which initially showed the progress of various ‘carparks’ around London known as the M1 and arterial roads, slowly gave way to pictures of beers and wines being consumed. Saturday wasn’t looking especially promising with a frigid air temperature and little sun. However the current climbing team are super keen and were undaunted. Following Alix’s hot tip Chuck, Simon, Chris, Marie, Rhona and David headed for the sheltered Lawrencefield. 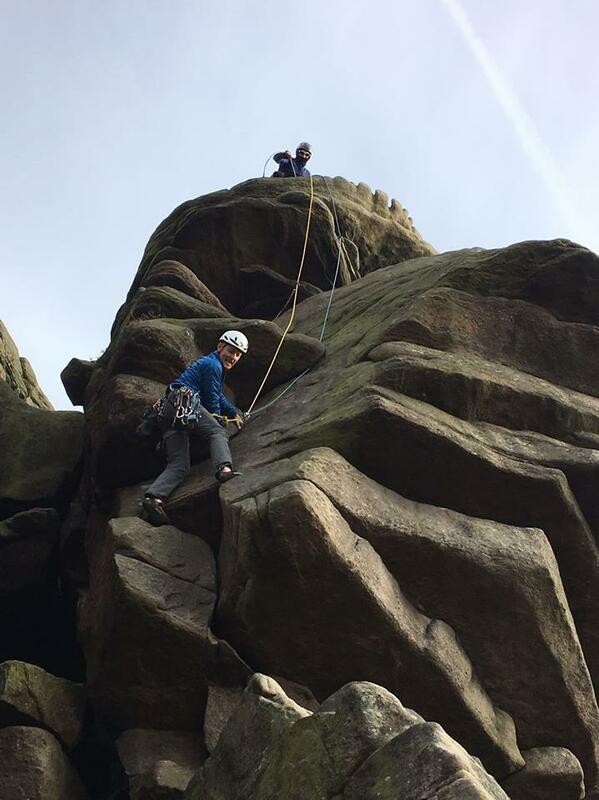 The first climbs (Snail Crack, VD, Nailsbane VD and Nova HS4b) all resulted in very numb fingers and hands. Gradually the air warmed up. 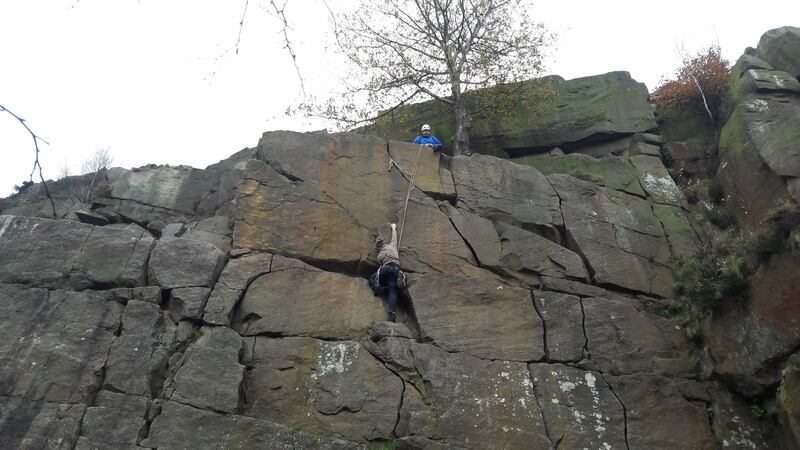 Everyone climbed Snail Crack and David/Rhona and Simon/Chuck climbed the excellent Three Tree Climb (HS4b). Chuck also nipped up a possible VS Tyrone (?). The slender beech trees with their browning leaves and the orange tint in the rock were beautiful in the early afternoon sun. They were so glad they had taken the chance and climbed. 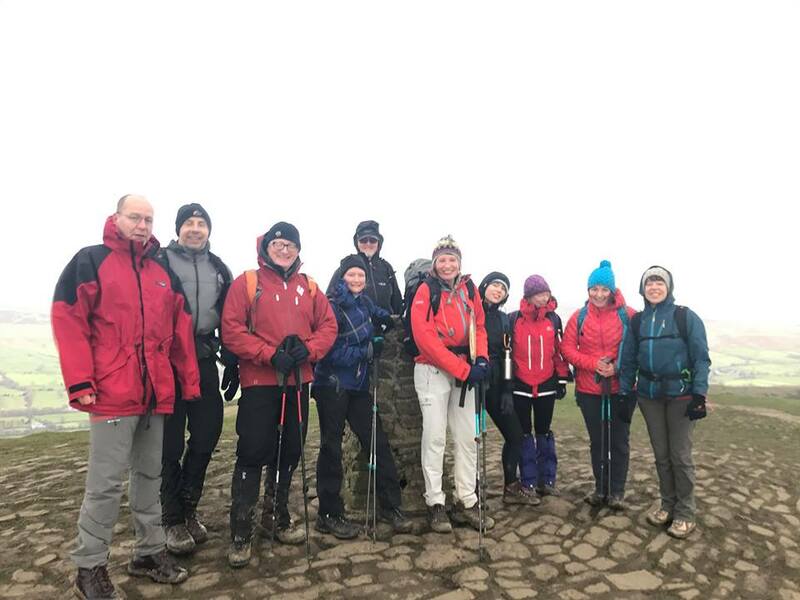 Walking groups split a little with Jules leading the masses on a circumnavigation of the Castleton ridge via Lose Hill, Hollins cross Mam Tor and past the Peveril castle via the limestone way. Jules and Howard taking a slightly earlier route back via the bar in an attempt to find some rugby playing, leaving the crowd to complete the extra distance. Nicole deciding on a somewhat faster outing following a fell runner and some dogs around onto the Kinder plateau via Hollins Cross up Ringing Roger and a sweep of the Edale valley. And so following a quick AGM, the group now 23 strong with the additions of Simon and Rob headed forthwith to the Peak Hotel and a delightful three course meals & mince pies for Marie-Jo. 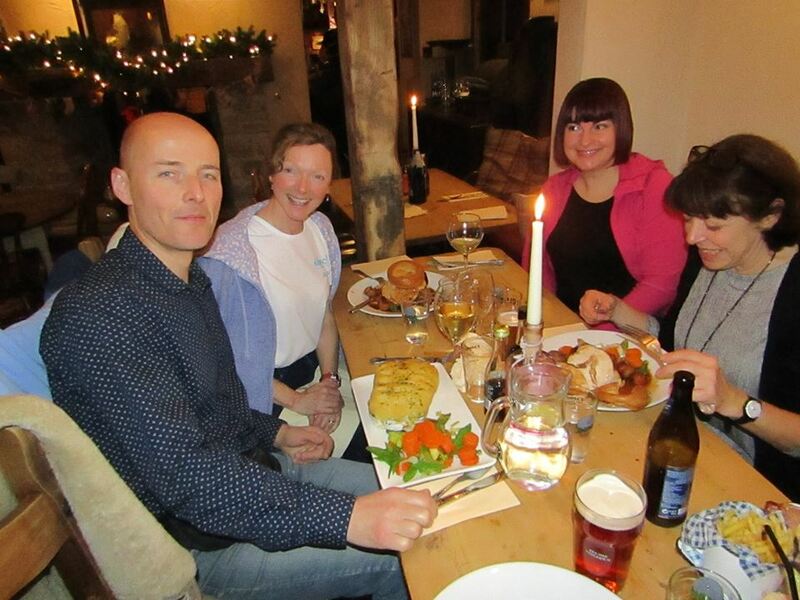 The pub had delivered well on the food, even if no Reindeers could be found. 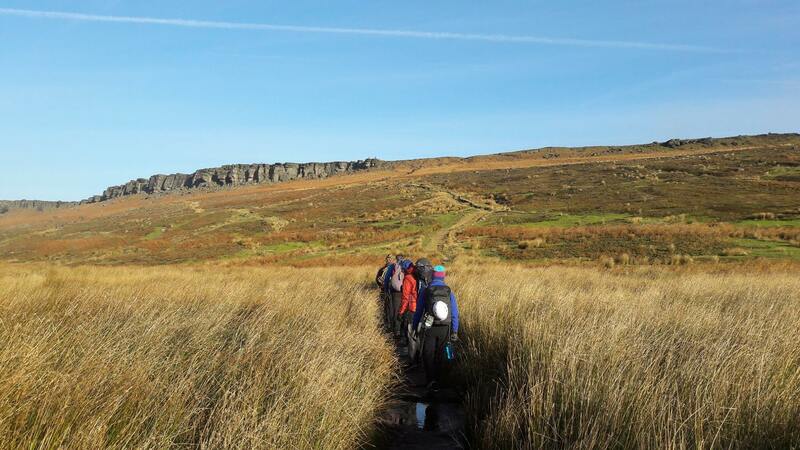 On Sunday with a better weather forecast (less wind) the climbing team headed to Stanage. Chris led Flying Buttress HVD, Simon and Chuck climbed Leaning Buttress Crack VD, Oblique Crack S and a queer combo of Queersville and Hollybush Crack. David and Rhona climbed Christmas Crack HS 4a and Right Hand Trinity S4b. Once again the scenery was sublimely beautiful and in the sun at times pleasant. Belayers at the top however experienced the typical Stanage air flow but with winter teeth. 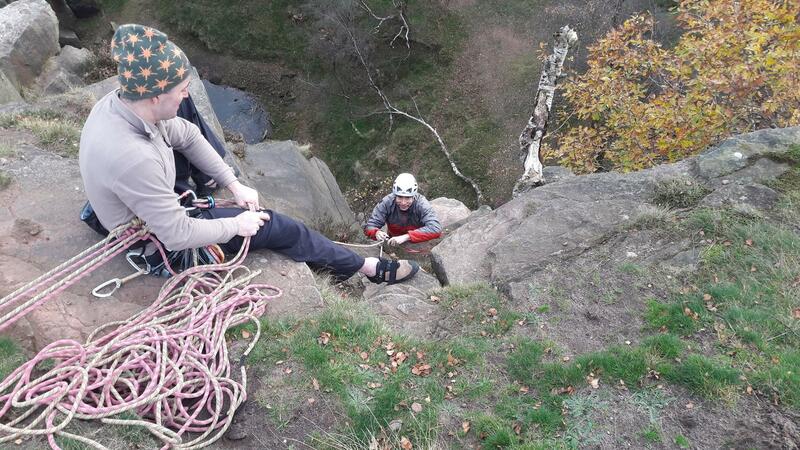 Another memorable day on the crag. Alix was key to the walking crowd again, promising a bit of a wander round the moor to a pub starting in the plague village of Eyam. Simon, Caroline, Rob, Robin, Helen, Lena and Sarah joined the sojourn to Barrel Inn via Eyam moor and Highlow Brook. Cath, Katherine, Nicole and Wendy headed to see the Otters and Owls in Chapel-en-le-Frith. Howard and Jules opting to visit the eponymous Castle of the town. 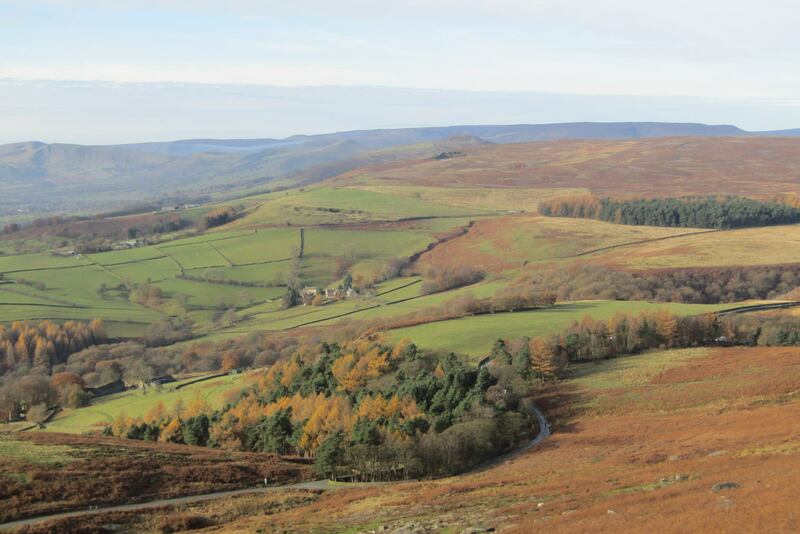 Everyone then wended their way back to London, with fun memories from a glorious weekend of activities in the Peaks.